A quick search of the Internet will turn up many sites for men lost in U.S. submarines, often with figures that differ from ours. This page attempts to help bring those varying statistics into line, and serve as a guide for submarine veterans' organizations with accurate and consistent information to use in their memorial events. We believe that no listings as extensive as those depicted on the pages of this site are without error. We always welcome corrections, additions, or comments. Research is on-going, and we are constantly updating our data. However, we stand behind the research as presented on this site with authoritatively verifiable evidence. We are at the point where changes in the number of men who were lost with their boats are highly unlikely (although not impossible - with information received from DPAA we added a page for a man lost with USS Grayling (SS-209) on January 7, 2019). We therefore believe that the listings of lost submariners on this site are by far the most accurate and complete available, especially for World War II losses. For a general listing of research sources, see our Sources page. The statistics presented below represent thousands of hours of original research into the records of more than 4,000 individual submariners. Our findings are not a result of copying group listings from secondary sources. The evidence on which we base our information, in nearly every case of submariner fatality during World War II, is found by accessing individual personnel files in the National Archives' National Personnel Records Center, St. Louis. This research has been done (and is still being done) almost entirely by World War II submarine veteran Paul W. Wittmer, with input by Charles R. Hinman. We are also in touch with the families of hundreds of the men we seek to honor, many of whom have donated photos, documents, and information. U. S. Submarine war patrol reports in hard copy have been accessed in the Archives of USS Bowfin Submarine Museum, and online at http://www.hnsa.org/resources/manuals-documents/submarine-war-reports/ . U. S. Navy Casualty Books, 1776-1941. Accessed for pre-World War II submarine personnel losses. Available on Ancestry.com (subscription required) at http://search.ancestry.com/search/db.aspx?dbid=2324&path=. U. S. Navy Casualty Lists, Book 11, pp. #2042 - #2152, Submarine War Patrols, Pacific - 7 December 1941 to 2 September 1945, noted below as Navy Casualty. This listing was provided to us by Michael W. Pocock of the Maritime Quest website. A recently completed man-by-man comparison of our World War II lost submariner listings with those shown in Navy Casualt confirms complete agreement between our two sets of applicable data. In the Notes to the Discrepancy Table below, all of the men that we suggest to Add to the listings of lost submariners of World War II appear in Navy Casualty, and none of the men that we suggest to Remove appear on the lists. Access to U. S. World War II Muster Rolls have recently been made available on Ancestry.com (subscription required) at http://search.ancestry.com/search/db.aspx?dbid=1143 . U.S. Submarine Losses - World War II, which was first published in 1946, then republished with some corrections (and a few mistakes of its own) in 1949, and finally republished in 1963 (unfortunately reinserting many of the errors in the 1946 edition). See	www.history.navy.mil/research/library/online-reading-room/title-list-alphabetically/u/united-states-submarine-losses.html on the website of the Naval History & Heritage Command for the online version of the 1963 edition. Discrepancies are noted below, as Sub Losses. The online version on the NHHC website has recently been updated, and is now entirely consistent with On Eternal Patrol research. We have a seperate page detailing the now corrected Discrepancies in Submarine Losses that were found on the NHHC website. State Summary of War Casualties from World War II for Navy, Marine Corps, and Coast Guard Personnel - (noted below as NARA) Immediately after the War, the Navy Department published their State Summaries. They are available online on the website of the National Archives and Records Administration (NARA) at http://www.archives.gov/research/military/ww2/navy-casualties/). Within this are also lists of POWs who were released from prison camps. Dictionary of American Naval Fighting Ships (DANFS). In most of its entries on submarines, DANFS does not list the number of men lost. In the few that do list these statistics, our numbers disagree with theirs in three instances - for Argonaut, Bass, and Cochino (older version only). "DANFS Online - Submarines" (the older version) is available on the Haze Gray and Underway site at www.hazegray.org/danfs/submar/. Discrepancies are noted below, as DANFS. Newly rewritten versions are available online at http://www.history.navy.mil/research/histories/ship-histories/danfs.html, although the numbers of men lost on Argonaut and Bass remain uncorrected. The newly established Defense POW/MIA Accounting Agency (DPAA) (part of which was the former Defense Prisoner of War - Missing Personnel Office (DPMO)), maintains a listing of 73,515 Americans who were buried with honor as unknowns, officially buried at sea, lost at sea, and missing in action, entitled "Service Personnel Not Recovered Following WWII" (http://www.dpaa.mil/Our-Missing/World-War-II/Service-Personnel-Not-Recovered-Following-WWII/). Approximately 3,500 of those were men of the U.S. Submarine Force. A recently completed man-by-man comparison of our World War II lost submariner listings with those shown on the DPAA website reveals a small number of discrepancies between our sets of data, which we are presently attempting to rectify. However, in the Notes to the Discrepancy Table below, all of the men that we suggest to Add to the listings of lost submariners of World War II appear on the DPAA lists, and none of the men that we suggest to Remove appear on their lists. Note that you may use their "Search Our Missing" page (https://dpaa.secure.force.com/dpaaOurMissing) to generate a lost personnel listing on any one submarine by typing in the name of the boat in their search bar. Unfortunately, some men, particularly officers, are occasionally not listed by unit (submarine) name. U. S. Rosters of World War II Dead, 1939-1945, available online on the Ancestry.com website (http://search.ancestry.com/search/db.aspx?dbid=1102) (noted below as War Dead). Again, all of the men that we suggest to Add to the listings of lost submariners of World War II appear on these rosters, and none of the men that we suggest to Remove appear on their lists. The Register of the Commissioned Officers of the United States Navy and Marine Corps (noted below as Officers) is available online on the late Patrick Clancey's HyperWar website at http://www.ibiblio.org/hyperwar/AMH/USN/Naval_Registers/. American Battle Monuments Commission (ABMC) maintains files for the nearly 225,000 American war dead who are buried at their cemeteries or commemorated on their Tablets of the Missing. Their website is a good source for obtaining Service Numbers, but is unreliable for their listings of medals and awards. Search their listings at http://www.abmc.gov/search-abmc-burials-and-memorializations. With the advent of the World Wide Web, many versions of lost submariner listings began to appear, notably on sites using the compilations of our highly-respected colleague, Jim Christley. They first appeared on the old SUBNET website, and later on Jim's own OldSubsPlace website, although both are no longer online. His listing of individual men lost in submarines has been, however, faithfully reproduced (with some corrections) on Ric Hedman's well done Pigboats site as "Personnel Lost aboard U.S. Submarines." We have made more than 500 verified corrections to Jim's initial listings. Discrepancies are noted below, as Christley. Other (sometimes contradictory) parts of Jim's research live on in the form of figures of men lost in each boat listings copied onto contempory websites. Again on Ric's Pigboats site are two additional separate listings that give information on lost boats and the number of men lost. 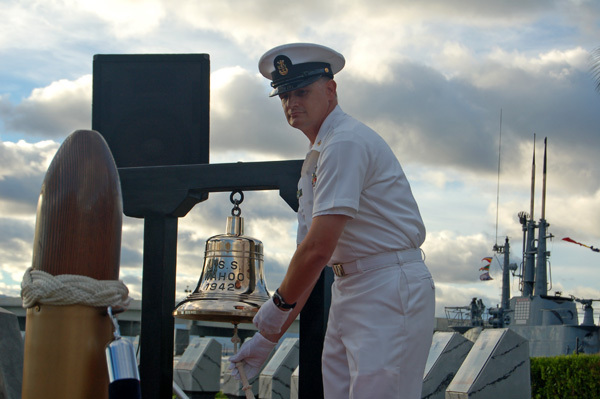 Ric has recently updated his "Toll The Bell" page, which, with one exception (the figures for USS Pompano and USS Grayling are reversed), coincides perfectly with our research. However, his "Lost Submarines and Crews" page still has numerous errors. Discrepancies on this list are noted below, as Pigboats. Commander Submarines Pacific (COMSUBPAC) had a website that formerly included listings for lost submariners. Many of those pages, which were authored by colleague Darrell D. Ames, are available on the NavSource website. Darrell generally used the U.S. Submarine Losses listings, with some revisions. Ed Howard's United States Submarine Losses in World War II pages on his Subsowespac.org website list links to the respective boat pages on On Eternal Patrol. Additionally, as stated above, a recently completed man-by-man comparison of our World War II lost submariner listings with those shown on the DPAA website (Service Personnel Not Recovered Following WWII) confirms complete agreement between our two sets of applicable data, with two exceptions. A page entitled U.S. Submarines Lost through Enemy Action and through Accidents (no longer online) used to be on the website of the Naval History & Heritage Command. It used essentially the same figures that we suggested to them in 2009, although it did not have updated figures for Amberjack, Argonaut, Capelin, Robalo, S-4, and S-28. Finally, the monthly Tolling of the Boats service in the Subase Chapel, Pearl Harbor, is entirely in-line with the figures shown here. Please note that the "Tolling of the Boats" column lists the number of men lost according to the most commonly used criteria for ceremonies conducted by submarine veterans groups, such as the SubVets of World War II and the USSVI. Figures under the "Lost with Boat" column are the number of deaths that occurred only at the time of the loss of the vessel, including men who died as a direct result of their vessel's loss. Prisoner of War (POW) deaths are listed separately, although they are nearly always included in totals for the lost boats. In many cases, sources that show figures differing from ours do not list the individual men lost, making conclusive analysis difficult. In all cases of World War II losses, we list extensive individual data on personal memorial pages, including name, rank/rate, Service Number, and other unique personal data, as well as a photograph, whenever available. Currently, over 89% of lost World War II submariners have photos on their personal memorial pages on this site. This listing does not include men who were lost off of boats that were not lost, with the exception of USS Bass (SS-164). For those individual losses, please see our Additional Losses page. Men who were lost in non-sinking events whose vessels were later lost are included with their shipmates on the individual boats' pages, and are listed on this table under "Additional Losses prior to loss of vessel." Please note that USS Bass (SS-164) is included on this list because of the large number of men lost, even though the vessel herself was not lost. Although decommissioned at the time of her loss, USS G-2 (SS-27) is included here because of the loss of life. Albacore (SS-218) – 85 killed. Remove Wright, Sylvester Martin, StM2, 969 07 34 – transferred off the boat on October 28, 1944, immediately before she was lost, and survived the War. He is not listed in NARA, nor in Navy Casualty, nor in DPAA, nor in War Dead, nor in ABMC, nor on the COMSUBPAC page. Source: individual personnel files, National Personnel Records Center, St. Louis, and muster rolls of USS Albacore. He served on LST-221 after the War. Origin of discrepancy (86) found in Sub Losses (1946 and 1963, although he is not listed in 1949) and in Christley, who mistakenly included Sylvester M(artin) Wright. Amberjack (SS-219) – 72 killed, or 73 killed if Beeman is included. Note that Arthur Castles Beeman was killed by gunfire during battle surface, twelve days before Amberjack was lost, on the same war patrol. Remove Chrzan, Raymond John, TM3. 608 04 24 – transferred off the boat on January 26, 1943, and survived the War. He was serving on USS Guardfish (SS-217) at the time Amberjack was lost. He died on May 30, 2006. Sources: individual personnel files, National Personnel Records Center, St. Louis, muster rolls of Amberjack and Guardfish, and direct contact with his son. Origin of discrepancy (74, which also includes Arthur Castles Beeman) found in Sub Losses (1963) and in Christley. Add Cacciato, Diego, Jr., TM3, 368 47 99 – died with his shipmates. Source: individual personnel file, National Personnel Records Center, St. Louis, Navy Casualty, DPAA, listings, and muster rolls of USS Amberjack. See www.oneternalpatrol.com/cacciato-d.htm. Origin of discrepancies (73, including Beeman, with Cacciato omitted and Chrzan mistakenly added) found in Sub Losses (1946). Argonaut (APS-1/SS-166) – 102 killed. Remove Widener, Hubert Rosco, CYN, 272 03 12 – survived the War. During the War, he served on four submarines: Grayling, Triton (relief crew), Argonaut, and Runner (relief crew), all of which were lost later in the War. He died on June 23, 1992. Remove DeGuzman, Jose, COC, 497 94 16 – transferred off USS Argonaut; survived the War; served with Mariano Ramos, Jr. (below) on USS Dolphin in September of 1943. Remove Ramos, Mariano, Jr., OS1, 497 93 13 – transferred off USS Argonaut; survived the War; served with Jose DeGuzman (above) on USS Dolphin in September of 1943. None of these men are listed as lost in NARA, Navy Casualty, DPAA, War Dead, ABMC, or the SubVets of WWII documentation. Origin of discrepancy (105) found in Sub Losses (1946 and 1963), in DANFS (both old and new versions), and in Christley. Sources: muster rolls of USS Argonaut and USS Pogy, and those of the other submarines that Widener served on. Origin of discrepancy (83) found in Sub Losses (1949), which mistakenly omitted all 19 men whose last names began with the letters R, S, and T. The 1949 edition correctly did not list DeGuzman, Ramos, and Widener. Bass (SS-164) – 26 died. Source: individual personnel files, National Personnel Records Center, St. Louis. See www.oneternalpatrol.com/uss-bass-164.htm for a complete listing. Origin of discrepancy (25) found in DANFS (both old and new versions). Bullhead (SS-332) – 84 killed. Origin of discrepancy (86) found in Christley, who has double listings for Alfred Aiple, Jr., and Glen M. Davidson. Capelin (SS-289) – 76 killed. Greenleaf, D. T., CMoMM, Rhimann, R. C., LT(jg), and Smith, D. T., MoMM2 are often listed on "Lost Submariners" memorials, and/or included in the figures that are given for the lost boats. It is highly doubtful that these three men were on the boat's final patrol. "Greenleaf, D. T." and "Smith, D. T." never appear in Capelin's muster rolls (two other Smiths do, and are accounted for in our listings), and Rhimann has not been found in any record other than that listed below. No "Rhimann" (nor any probable spelling variation of the name) is listed in the Register of Commissioned and Warrant Officers of the United States Navy and Marine Corps, 1942 and 1943 editions, nor in the Register of Commissioned Officers, Cadets, Midshipmen, and Warrant Officers of the United States Naval Reserve, 1943. The original source of these three names is U.S. Submarine Losses - World War II. Greenleaf, Rhimann, and D.T. Smith appear in the 1946 edition, were removed in the 1949 edition, and Rhimann and D. T. Smith were re-entered in the 1963 edition. None of these men are listed as lost in NARA, Navy Casualty, DPAA, War Dead, ABMC, or the SubVets of WWII documentation. We believe that Greenleaf, Rhimann, and D. T. Smith were not aboard the vessel when she was lost, if ever. We are currently conducting further research on these three men. Cisco (SS-290) – 76 killed. Add Millard, Lawrence Charles, SM2, 410 81 17 – died with his shipmates. Source: individual personnel file, National Personnel Records Center, St. Louis, Navy Casualty, DPAA listings, War Dead, and muster rolls of USS Cisco. See www.oneternalpatrol.com/millard-l-c.htm . Origin of discrepancy (75) found in Christley, who mistakenly omitted Lawrence Charles Millard. Cochino (SS-345) – 1 killed (Civilian Engineer Robert Wellington Philo). USS Tusk (SS-426), who had come to the aid of the stricken Cochino, lost six men during the rescue. They are listed on the Additional Losses - Post-WWII page. Origin of discrepancy (0) found in DANFS, which states, "All Cochino 's men were rescued by the valiant Tusk who had lost seven of her own men in the attempt to save Cochino." In a rewritten version of the entry by Bob Cressman, these errors have been corrected. Darter (SS-248) – 0 killed. One man, Robert Richard Gould, Jr., was working on the boat as a member of Darter's relief crew between war patrols when he was killed aboard by electric shock. Escolar (SS-294) – 82 killed. Sources: individual personnel files, National Personnel Records Center, St. Louis, and muster rolls of USS Escolar. Origin of discrepancy (83) found in Christley - double listing for Fox, Lynn B(urton), RT1, 725 60 01. F-4 (SS-23) – 21 killed. See www.oneternalpatrol.com/uss-f-4-23.htm for a complete listing. The "19 men lost" listings in various sources possibly omits the two officers aboard at the time of the sinking. Some sources have been found to have mistakenly omitted Walter Frank Covington and Ivan Lenore Mahan. Golet (SS-361) – 82 killed. Add Beaulieu, Donald William, GM3, 328 80 44 – died with his shipmates. See www.oneternalpatrol.com/beaulieu-d-w.htm . Add McLaughlin, Harry Bland, Jr., LT, 0-103605 – died with his shipmates. See www.oneternalpatrol.com/mclaughlin-h-b.htm. Sources: individual personnel files, National Personnel Records Center, St. Louis, Navy Casualty, DPAA listings, War Dead, muster rolls of USS Golet, and correspondence with Donald's family. Origin of discrepancy (80) found in Christley, who mistakenly omitted both Donald William Beaulieu and Harry Bland McLaughlin. Grampus (SS-207) – 71 killed. Remove Merrill, Wayne Rucker, LT, O-73564 Survived the War. He commanded USS Batfish (SS-310) from 21 Aug 1943 to 14 May 1944. He is incorrectly listed as lost with USS Grampus in some sources. Add O'Connor, Edward Roger, LT, O-097830 – died with his shipmates. Sources: individual personnel file, National Personnel Records Center, St. Louis, Navy Casualty, DPAA, War Dead listings, and correspondence with his family. See www.oneternalpatrol.com/oconnor-e-r.htm. Add Roberts, Leland Hayward, TM3, 372 33 56 – died with his shipmates. Sources: individual personnel file, National Personnel Records Center, St. Louis, Navy Casualty, DPAA, and War Dead listings, and muster rolls of USS Grampus. See www.oneternalpatrol.com/roberts-l-h.htm. Origin of discrepancy (70) found in Christley, who mistakenly included Wayne Rucker Merrill and omitted both Edward Roger O'Connor and Leland Hayward Roberts. Some sources, including Sub Losses (1949 and 1963 editions) come up with the correct number of men lost (71), but do so by mistakenly including LT Merrill and omitting LT O'Connor. The 1946 edition correctly does not list LT Merrell and correctly includes LT O'Connor. Grayback (SS-208) – 80 killed. Sources: individual personnel files, National Personnel Records Center, St. Louis, Navy Casualty, and DPAA listings. See www.oneternalpatrol.com/uss-grayback-208.htm for complete listing. Origin of discrepancy (77) found in Christley, who mistakenly omitted Raymond Leon Mayo, Franklin Hotchkiss McKelvey, and Frederick William Herman Meyer. Grayling (SS-209) – 77 killed, including one U.S Army Air Force man. Sources: individual personnel files, National Personnel Records Center, St. Louis, Navy Casualty, and DPAA, and War Dead listings. See www.oneternalpatrol.com/uss-grayling-209.htm for complete listing. Origin of discrepancy (75) found on the former COMSUBPAC website, which mistakenly omitted Clark, Curtis Devault, F1, 640 05 91 (www.oneternalpatrol.com/clark-c-d.htm), who died with his shipmates. Almost all other sources, until recently including this site, listed 76 men. Information provided by DPAA confirms that a USAAF man, Roy Walter Wilfon, was picked up from a island in the Philippines, and was subsequently lost with the vessel. Sources: DPAA records and direct communication with Wilfon's grandniece. Growler (SS-215) – 86 killed. Add Thompson, Harold Eugene, PhM1, 700 54 85 – died with his shipmates. Sources: individual personnel file, National Personnel Records Center, St. Louis, Navy Casualty, DPAA, and War Dead listings, and muster rolls of USS Growler. See www.oneternalpatrol.com/thompson-h-e.htm . Origin of discrepancy (85) found in Sub Losses (1946 and 1963, although he is listed in 1949). Origin of discrepancy (84) found in Christley, who omitted James Wesley Stubblefield and Carl Francis Suba, although he does include Thompson (without first and middle names). Note that three men, including Medal of Honor recipient Howard Walter Gilmore, were lost in a surface engagement with the enemy on February 7, 1943, and one man was killed in an accident ashore. Grunion (SS-216) – 70 killed. Sources: individual personnel files, National Personnel Records Center, St. Louis, Navy Casualty, DPAA, and War Dead listings. See www.oneternalpatrol.com/uss-grunion-216.htm for complete listing. Origin of discrepancy (69) found in Christley, who omitted Charles Roy Hutchinson. Gudgeon (SS-211) – 79 killed. Add Swinson, Paul Westley, StM2, 836 99 38 – died with his shipmates. Sources: individual personnel file, National Personnel Records Center, St. Louis, Navy Casualty, DPAA, and War Dead listings, muster rolls of USS Gudgeon, and correspondence with his family. See www.oneternalpatrol.com/swinson-p-w.htm . Origin of discrepancy (78) found in Sub Losses (1963, although he is listed in 1946 and 1949). Origin of discrepancy (75) found in Christley, who, besides Swinson, also omitted Oscar Allen Abbott, William Ankeny, and James Robert Ball. Remove Hall, Verl Edward, MoMM1, 661 08 77, who was on emergency leave when USS Gudgeon left on her twelfth war patrol on 4 April 1944. Sources: Navy Casualty and muster rolls of USS Gudgeon. Origin of discrepancy (80) found in Sub Losses (1949). Herring (SS-233) – 83 killed. Remove Fleming, Clyde Denton, S2, 386 75 66 – transferred off Herring on 20 May 1944, and survived the War. He was serving on USS Louisville (CA-28) when the War ended, and served on numerous other vessels in the Navy until at least 1954. Not listed in NARA, Navy Casualty, DPAA, War Dead, ABMC, or on COMSUBPAC page. Sources: muster rolls of USS Herring and USS Louisville. He died on 11 March 1993. Origin of discrepancy (84) found in Sub Losses (1946 and 1963), and in Christley. Note that one man, Louis Hill Jones, drowned at Midway on January 26, 1944. Origins of discrepancies (80-82) unknown. All known listings of individual Herring losses, including Navy Casualty and DPAA listings, show 83 men lost. See www.oneternalpatrol.com/uss-herring-233.htm for a complete listing. Kete (SS-369) – 87 killed. Add Griswold, Fred Joseph, S1, 870 31 13 – died with his shipmates. See www.oneternalpatrol.com/griswold-f-j.htm . Add Newton, Archie Vernon, MoMM1, 262 31 27 – died with his shipmates. See www.oneternalpatrol.com/newton-a-v.htm. Sources: individual personnel files, National Personnel Records Center, St. Louis, Navy Casualty, DPAA, and War Dead listings, muster rolls of USS Kete, and correspondence with their families. Origin of this discrepancy (85) found in Christley. Add Kotelman, Walter Ernest, RM3, 810 71 30 – died with his shipmates. See www.oneternalpatrol.com/kotelman-w-e.htm. Sources: individual personnel files, National Personnel Records Center, St. Louis, Navy Casualty, DPAA, and War Dead listings, muster rolls of USS Kete, and correspondence with Walter's friend. Origin of this discrepancy (86) found in Sub Losses (1946). Lagarto (SS-371) – 86 killed. Add Lee, Russell Willie, F1, 644 83 76 – died with his shipmates. Sources: individual personnel file, National Personnel Records Center, St. Louis, Navy Casualty, DPAA, and War Dead listings, and muster rolls of USS Lagarto. See www.oneternalpatrol.com/lee-r-w.htm Origin of discrepancy (85) found in Sub Losses (1946 and 1963, although he is listed in 1949) and in Christley. Origin of discrepancy (88) found on Pigboats. * Note that two men, Pat Cole and Walter Raymond Shaw, died ashore in separate jeep accidents. O-5 (SS-66) – 3 killed. See www.oneternalpatrol.com/uss-o-5-66.htm for complete listing. Note that three other men were killed in a non-sinking event five years prior to the sinking of the vessel. O-9 (SS-70) – 33 killed. Remove Davis, Burton Alfred, RM3, 201 65 33 – transferred off O-9 on 29 May 1941, went on to serve on various other vessels, and survived World War II. He was serving on USS Higbee (DD-806) as a Radio Technician, First Class, on 1 October 1945. Sources: muster rolls of USS O-9, USS Higbee, and other vessels. Perch (SS-176) – Of 59 officers and men, six died as POWs. Remove Atkeison, Warren Ingram, TM3, 272 15 06, USS Perch survivor liberated from POW camp on 17 September 1945. Remove Greco, John, TM1, 238 55 57, Perch survivor liberated from POW camp on 21 September 1945. Remove Kerich, Thomas Leslie, F3, 376 34 41, Perch survivor liberated from POW camp on 17 September 1945. Remove Osborne, Robert Willis, S1, 368 47 55, Perch survivor liberated from POW camp on 17 September 1945. Sources: individual personnel files, National Personnel Records Center, St. Louis; NARA (in their "Released from Prison Camps" sections), Navy Casualty, crew rosters; interviews with surviving crew members, and for John Greco, direct contact with his son. Origin of discrepancy (9 died as POWs, erroneously including Greco, Kerich, and Osborne) found in Sub Losses (1946), and (8 died as POWs, erroneously including Atkeison and Greco) found in Sub Losses (1949), and (9 died as POWs, erroneously including Atkeison, Greco, and Osborne) found in Sub Losses (1963). See complete crew list at www.oneternalpatrol.com/uss-perch-176.htm . Pickerel (SS-177) – 74 killed. Add Kimball, Ralph Fenton, FC1, 261 82 27 – died with his shipmates. Sources: individual personnel files, National Personnel Records Center, St. Louis, Navy Casualty, DPAA, and War Dead listings, and muster rolls of USS Pickerel. See www.oneternalpatrol.com/kimball-r-f.htm. Origin of discrepancy (73) found in Christley, who mistakenly omitted Ralph Fenton Kimball. Pompano (SS-181) – 77 killed. Add Jennings, George Alfred, MoMM2 – died with his shipmates. Sources: individual personnel file, National Personnel Records Center, St. Louis, Navy Casualty, DPAA, and War Dead listings, muster rolls of USS Pompano, and correspondence with his family. See www.oneternalpatrol.com/jennings-g-a.htm. Origin of discrepancy (76) found in Sub Losses (1946). Add Poole, Claire Cornwell, LT, 0-100368 – died with his shipmates. Source: individual personnel file, National Personnel Records Center, St. Louis, Navy Casualty, DPAA, and War Dead listings, USNA Register of Alumni, and correspondence with his family. See www.oneternalpatrol.com/poole-c-c.htm . Origin of discrepancy (76) found in Sub Losses (1963). Note that one man, Herbert Andrew Calcaterra, was killed while manning the boat's deck gun on September 4, 1942. Origin of discrepancy (71) found in Christley, who mistakenly omitted Lowell Keith Gray, Robert Richard Gross, Hiram Paul Guess, Donald Sidney Hanson, and Fred Joseph Kirschbaum, as well as Claire Cornwell Poole. See www.oneternalpatrol.com/uss-pompano-181.htm for a complete listing. R-12 (SS-89) – 42 killed (40 crew members and two Brazilian Naval Officers aboard as observers). See www.oneternalpatrol.com/uss-r-12-89.htm for a complete listing. Runner (SS-275) – 78 killed. Add Boone, Josiah Alexander, MoMM1, 262 31 20 – died with his shipmates. Source: individual personnel file, National Personnel Records Center, St. Louis, Navy Casualty, DPAA, and War Dead listings, and muster rolls of USS Runner. See www.oneternalpatrol.com/boone-j-a.htm. Origin of discrepancy (77) found in Christley, who mistakenly omitted Josiah Alexander Boone. S-4 (SS-109) – 40 killed. Discrepancy (34) probably stems from omitting the five officers and one civilian who were lost with the boat. Origin of discrepancy (38) found in Christley, who omitted William Franklin Callaway, observer aboard from the Bureau of Construction and Repair, and Charles A. Ford, civilian observer aboard from the Bureau of Construction and Repair. See www.oneternalpatrol.com/uss-s-4-109.htm for a complete listing. S-28 (SS-133) – 49 killed. Remove Bolton, Levi, StM1, 628 12 12 – transferred off USS S-28; survived the War. He was serving on Lizardfish (SS-373) when the War ended. He went on to career in U.S. Air Force. Sources: muster rolls of USS S-28, conversations with a surviving former crew member, and direct contact with his son. Origin of discrepancy (50) found in Sub Losses (1963), and in Christley. S-44 (SS-155) – 56 killed. (For clarity’s sake, 2 POWs survived) Add Erico, Daniel Benjamin, CHBOSN, W-184673 – died with his shipmates. Sources: individual personnel file, National Personnel Records Center, St. Louis, Navy Casualty, DPAA, and War Dead listings, muster rolls of USS S-44, and correspondence with his family. Origin of this discrepancy (55) found in Sub Losses (1963), and in Christley. See www.oneternalpatrol.com/erico-d-b.htm . Add Quinn, Robert Groves, LT (XO), 0-085560 – died with his shipmates. Source: individual personnel file, National Personnel Records Center, St. Louis, Navy Casualty, DPAA, and War Dead listings. See www.oneternalpatrol.com/quinn-r-g.htm. Remove Watson, F. L. MoMM2. Watson does not appear in the muster rolls of USS S-44, nor in Navy Casualty. There was a Watson, Frank Lewis, MoMM2, 376 84 47 (375 84 47 in DPAA), listed as a crew member of YMS-341 (an auxiliary motor minesweeper) lost in a typhoon off Okinawa, on 16 September 1945. Origin of these two discrepancies found in Sub Losses (1949). Add Smith, George Francis, CSM, 283 07 64 – died with his shipmates. Sources: individual personnel file, National Personnel Records Center, St. Louis, Navy Casualty, DPAA, and War Dead listings, and muster rolls of USS S-44. Origin of this discrepancy (55) found in Sub Losses (1946). See www.oneternalpatrol.com/smith-g-f.htm. S-51 (SS-162) – 33 killed. Some sources mistakenly omit one of the two twin brothers (Frederick Peter Teschemacher and William Charles Teschemacher), who were both lost with the vessel. Origin of discrepancy (32) found in Christley, who omitted William Charles Teschemacher. Scamp (SS-277) – 83 killed. Add Di Nicola, Orlando Joseph, S2, 812 76 02 – died with his shipmates. Sources: individual personnel file, National Personnel Records Center, St. Louis, Navy Casualty, DPAA, and War Dead listings, muster rolls of USS Scamp, and correspondence with his family. See www.oneternalpatrol.com/dinicola-o-j.htm. Origin of discrepancy (82) found in Christley. Scorpion (SS-278) – 77 killed. Add Himes, David Alexander, MoMM3, 650 14 89 – died with his shipmates. Sources: individual personnel file, National Personnel Records Center, St. Louis, Navy Casualty, DPAA, and War Dead listings, and muster rolls of USS Scorpion. See www.oneternalpatrol.com/himes-d-a.htm . Origin of discrepancy (76) found in Sub Losses (1946 and 1963, although he is listed in 1949). Origin of discrepancy (74) found in Christley, who omitted David Alexander Himes, Billie Eugene Larimore, and Donald Stone Scheu. Sources: individual personnel file, National Personnel Records Center, St. Louis, Navy Casualty, DPAA listings, muster rolls of USS Scorpion (for Himes and Larimore), and USNA Register of Alumni (for Scheu). See www.oneternalpatrol.com/uss-scorpion-278.htm for complete listing. Sculpin (SS-191) – For clarity’s sake, 63 killed (12 killed in action prior to sinking, 30 killed in the sinking, one man killed in captivity (not officially a POW), 20 POWs later died), and 21 POWs survived. Origin of discrepancy (61) found in Christley, who omitted James Quinton Harper and John Barlow Swift. Sources: individual personnel files, National Personnel Records Center, St. Louis, published accounts given by Sculpin survivors after their repatriation, Navy Casualty, DPAA, and War Dead listings, and muster rolls of USS Sculpin. See www.oneternalpatrol.com/uss-sculpin-191.htm for complete listing. Sealion (SS-195) – 4 killed, plus one man who died as a POW. See www.oneternalpatrol.com/uss-sealion-195.htm for complete listing. Shark (SS-174) – 59 killed. Add Gimenez, Pedro, SC1, 160 85 87 – died with his shipmates. Sources: individual personnel file, National Personnel Records Center, St. Louis, Navy Casualty, DPAA and War Dead listings, and correspondence with his family. According to his personnel file in the National Archives, he transferred to Shark on 5 January 1942. See www.oneternalpatrol.com/gimenez-p.htm. Origin of discrepancy (58) found in Sub Losses (1963), although he is listed in the 1946 and 1949 editions. Snook (SS-279) – 84 killed. Add Crawford, George Loren, F1, 852 96 49 – died with his shipmates. See www.oneternalpatrol.com/crawford-g-l.htm. Origin of discrepancy (83) found in Sub Losses (1949). Both George Loren Crawford and John Lawrence Morgan were mistakenly left off of some other listings. Origin of this discrepancy (82) found on the former COMSUBPAC website. Sources: individual personnel file, National Personnel Records Center, St. Louis, Navy Casualty, DPAA, and War Dead listings, muster rolls of USS Snook, and correspondence with the family of G. L. Crawford. Tang (SS-306) – For clarity’s sake, 78 killed, 9 POWs survived. A few men who survived the sinking were not rescued. See www.oneternalpatrol.com/uss-tang-306.htm for complete listing. Origin of discrepancy (79) found in Sub Losses (1946), which mistakenly does not list Pete Narowanski as a survivor, but includes him as one of the lost. Origin of discrepancy (83) found on Pigboats. * Sources: individual personnel files, National Personnel Records Center, St. Louis, published accounts given by Tang survivors after their repatriation, books authored by Tang CO Richard O'Kane, Navy Casualty, DPAA listings, and muster rolls of USS Tang. Trigger (SS-237) – 89 killed. Add McDonough, G. W., RM1, 680 49 14 – died with his shipmates. Omitted from 1946 edition of U.S. Submarine Losses - World War II, but included in 1949 and 1963 editions. Sources: individual personnel file, National Personnel Records Center, St. Louis, Navy Casualty, DPAA, and War Dead listings, and correspondence with his family. See www.oneternalpatrol.com/mcdonough-g-w.htm . See www.oneternalpatrol.com/uss-trigger-237.htm for complete listing. Origin of discrepancy (91) found in Sub Losses (1949) which has double listings for Melton, R. H., and Misner, D. E.
Triton (SS-201) – 74 killed. See www.oneternalpatrol.com/uss-triton-201.htm for complete listing. Add Booth, Raymond, F1, 360 53 29 – died with his shipmates. Omitted from 1946 edition of U.S. Submarine Losses - World War II, but included in 1949 and 1963 editions. Sources: individual personnel file, National Personnel Records Center, St. Louis, Navy Casualty, DPAA, and War Dead listings, muster rolls of USS Triton, and correspondence with his family. Remove Thompson, Harold Ray, CEM, 291 23 72, who was transferred ashore at Wake Island in November 1941 due to illness. He was subsequently captured, survived the War in POW camp, and was repatriated in September 1945. Source: Documents in USS Bowfin Submarine Museum Archives, USS Triton file, and American Sailors and United States Marines at War and Peace, by Donald Johnson. Trout (SS-202) – 81 killed. See www.oneternalpatrol.com/uss-trout-202.htm for complete listing. Origin of discrepancy (79) found on Pigboats. All other known listings of individual Trout losses show 81 men. Tullibee (SS-284) – 79 killed. See www.oneternalpatrol.com/uss-tullibee-284.htm for complete listing. Origin of discrepancy (80) found on the former COMSUBPAC website, which had "80 men lost" in the title section of its Tullibee page. However, that number included the sole survivor, Clifford W. Kuykendall, as shown in the listing of the crew at the bottom of the page. A corrected version of the page may be found at navsource.org/archives/08/pdf/0828467.pdf. Wahoo (SS-238) – 80 killed. Discrepancy (79) possibly stems from the often seen phrasing, "CDR Mush Morton and 79 crewmen were lost ..." See www.oneternalpatrol.com/uss-wahoo-238.htm for complete listing. The usually reliable DPAA omits Joe Vidick, whose loss is confirmed in his service record, in Wahoo muster rolls, in NARA, in Navy Casualty, and in ABMC. Other than DPAA, all other known listings of individual Wahoo losses show 80 men. *For the boats whose notes say, "Origin of discrepancy found on Pigboats," and whose number listed in the "Common Discrepancies" exceeds the number in the "Tolling of the Boats" column -- Bonefish, Dorado, Flier, Harder, Lagarto, Robalo, Seawolf, Shark (SS-314), Swordfish, and Tang -- we would appreciate being told the names of those men we may have missed. We will then make every effort to verify their individual records, and make corrections, if needed.